As a lad of 12 to 13 years of age – going on 97 – Ginger Meggs is Australia’s oldest comic character and one of the oldest in the world. His creator was Jimmy Bancks, and currently a gifted young Australian artist, Jason Chatfield, is the fifth in a line of artists taking care of the little chap. Jason now resides in the U.S. where he not only draws Ginger Meggs but is in great demand for political cartoons. Ginger first appeared in 1921 as Ginger Smith in a comic strip called Us Fellers which was about a gang of boys who got into all sorts of trouble; a lone heroine, Gladsome Gladys, was included. The theme was for the little girl to use her charm to get the boys out of trouble if their cricket ball broke a window, their billycart knocked someone over or any other tragedy befell them. Gladys was named after the daughter of the lady who taught Bancks to draw. Bancks soon ran out of ideas for that theme and so brought Ginger forward in a lead role, changing his surname from Smith to Meggs and modelling him on Charles Somerville, a schooldays friend. He also gave him red hair because that was one of the only two colours other than black used in printing newspapers; Gladys was renamed Minnie Peters and given the role of Ginger’s girlfriend. 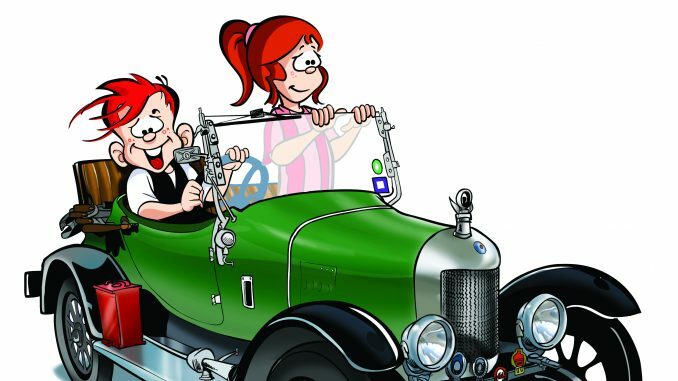 Other characters drawn from people in Bancks’s life were added as time went on, and so was born a uniquely Australian comic that captured Australia’s heart. In 1939 the strip was renamed ‘Ginger Meggs’. Ginger’s meteoric rise in popularity led to the production of the memorable Sunbeams Annual – Adventures of Ginger Meggs series from 1924 to 1959 as well as many items associated with the strip such as books, figurines, money boxes, breakfast sets, etc. Children also made their own toys featuring Ginger bycutting fretwork ornaments from 3-ply wood after gluing cut-out images on it. Along with the rival strip Fatty Finn, the strip introduced children’s billycarts to Australian suburban life.